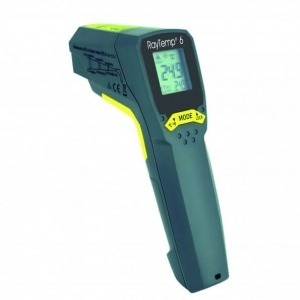 The RayTemp 6 incorporates an eight dot circle laser indicator, which allows you to precisely target the diameter of the area to be measured. As you move closer or further from the target the laser circle changes diameter. The unit incorporates an 12:1 optic ratio (target distance/diameter ratio) and features an adjustable emissivity which allows the user to measure a variety of surface types.